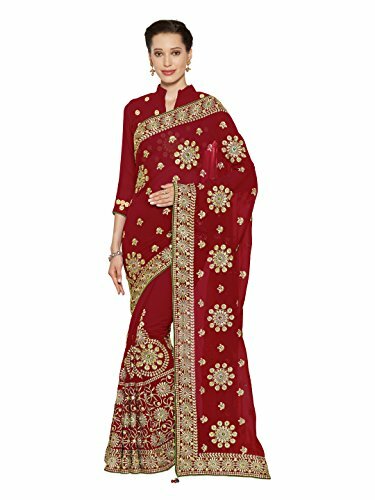 This is a Red Faux Georgette Embroidered Party Wear Saree.This Saree comes with an attached Faux Georgette blouse fabric which can be customised from 32" to 42".|| Usage Ideas: Wear this saree for special occasions, festivals, friends/family get-togethers, parties, ceremonies or rituals.|| Design Speciality: It is a Heavy Embroidery Zari Work design saree which is the latest and trendy design innovation and is highly appreciated design inspired by 2018 ethnic trends. || Fabric Features: The fabric is comfortable and easily drapes around your body to provide the perfect fit and shape. || Suitability: Bride, Bridesmaid, working women, girls, newly married. Also suitable for gifting to wife, sister, mother, friend on anniversary, birthday, festival, diwali, pooja, raksha bandhan, grah pravesh, marriage. Mirchi Fashion (division of Sourbh Sarees) brings together the best of Ethnic Fashion from the Indian subcontinent to Indian wear lovers across the world, with a variety of popular and trendy ethnic products for various occasions - wedding sarees, Party Wear Sarees, to contemporary Indian suits and salwar kameez. 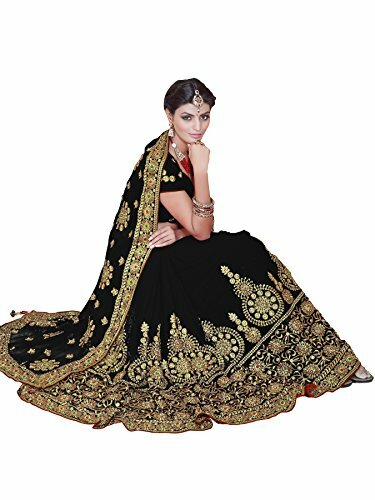 This is a Black Faux Georgette Heavy Embroidery Work Wedding Party Wear BridalSaree.This Saree comes with an attached Faux Georgette blouse fabric which can be customised from 32" to 42".|| Usage Ideas: Wear this saree for special occasions, festivals, friends/family get-togethers, parties, ceremonies or rituals.|| Design Speciality: It is a Heavy Zari Embroidery and Stone work design saree which is the latest and trendy design innovation and is highly appreciated design inspired by 2017 ethnic trends. || Fabric Features: The fabric is comfortable and easily drapes around your body to provide the perfect fit and shape. || Suitability: Bride, Bridesmaid, Housewife, working women, girls, newly married. Also suitable for gifting to wife, sister, mother, friend on anniversary, birthday, festival, diwali, pooja, raksha bandhan, grah pravesh, marriage. Mirchi Fashion (division of Sourbh Sarees) brings together the best of Ethnic Fashion from the Indian subcontinent to Indian wear lovers across the world, with a variety of popular and trendy ethnic products for various occasions - wedding sarees, Party Wear Sarees, to contemporary Indian suits and salwar kameez. 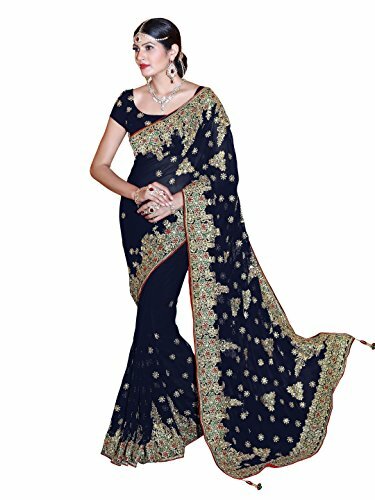 This is a Navy Blue Faux Georgette Embroidered Party Wear Saree.This Saree comes with an attached Faux Georgette blouse fabric which can be customised from 32" to 42".|| Usage Ideas: Wear this saree for special occasions, festivals, friends/family get-togethers, parties, ceremonies or rituals.|| Design Speciality: It is a fancy print design saree which is the latest and trendy design innovation and is highly appreciated design inspired by 2018 ethnic trends. || Fabric Features: The fabric is comfortable and easily drapes around your body to provide the perfect fit and shape. 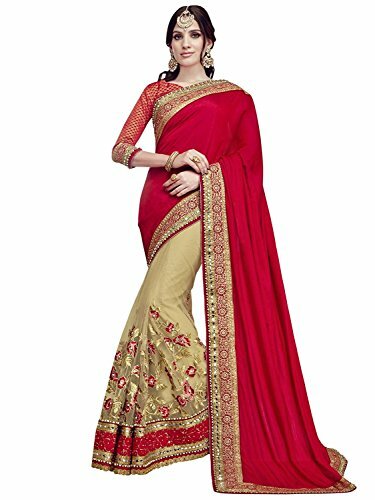 It is a light weight saree which you can adorn for hours while attending a party or function, providing you flexibility and comfort. || Suitability: Housewives, working women, girls, newly married. Also suitable for gifting to wife, sister, mother, friend on anniversary, birthday, festival, diwali, pooja, raksha bandhan, grah pravesh, marriage. Mirchi Fashion (division of Sourbh Sarees) brings together the best of Ethnic Fashion from the Indian subcontinent to Indian wear lovers across the world, with a variety of popular and trendy ethnic products for various occasions - wedding sarees, Party Wear Sarees, to contemporary Indian suits and salwar kameez. 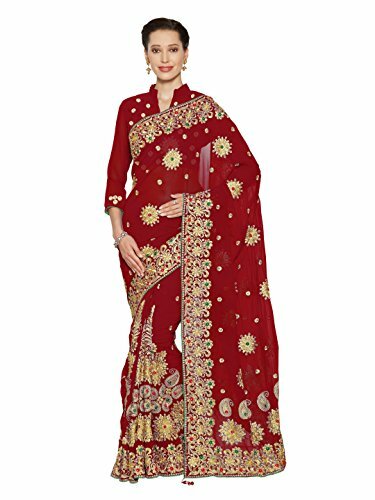 This is a Red color Faux Georgette Heavily Embroidered Wedding Bridal Wear Saree.This Saree comes with an attached Faux Georgette blouse fabric which can be customised from 32" to 42".|| Usage Ideas: Wear this saree for special occasions,weddings, festivals, friends/family get-togethers, parties, ceremonies or rituals.|| Design Speciality: It is a heavy embroidery and stone work design saree which is the latest and trendy design innovation and is highly appreciated design inspired by 2017 ethnic trends. || Fabric Features: The fabric is comfortable and easily drapes around your body to provide the perfect fit and shape. || Suitability: Bride, Bridesmaid, working women, girls, newly married. Also suitable for gifting to wife, sister, mother, friend on anniversary, birthday, festival, diwali, pooja, raksha bandhan, grah pravesh, marriage. Mirchi Fashion (division of Sourbh Sarees) brings together the best of Ethnic Fashion from the Indian subcontinent to Indian wear lovers across the world, with a variety of popular and trendy ethnic products for various occasions - wedding sarees, Party Wear Sarees, to contemporary Indian suits and salwar kameez. 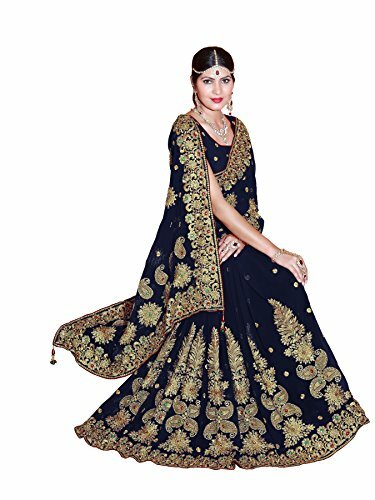 This is a Navy Blue Faux Georgette Heavily Embroidered Wedding Bridal Wear Saree.This Saree comes with an attached Faux Georgette blouse fabric which can be customised from 32" to 42".|| Usage Ideas: Wear this saree for special occasions,weddings, festivals, friends/family get-togethers, parties, ceremonies or rituals.|| Design Speciality: It is a heavy embroidery and stone work design saree which is the latest and trendy design innovation and is highly appreciated design inspired by 2017 ethnic trends. || Fabric Features: The fabric is comfortable and easily drapes around your body to provide the perfect fit and shape. || Suitability: Bride, Bridesmaid, working women, girls, newly married. Also suitable for gifting to wife, sister, mother, friend on anniversary, birthday, festival, diwali, pooja, raksha bandhan, grah pravesh, marriage. Mirchi Fashion (division of Sourbh Sarees) brings together the best of Ethnic Fashion from the Indian subcontinent to Indian wear lovers across the world, with a variety of popular and trendy ethnic products for various occasions - wedding sarees, Party Wear Sarees, to contemporary Indian suits and salwar kameez. 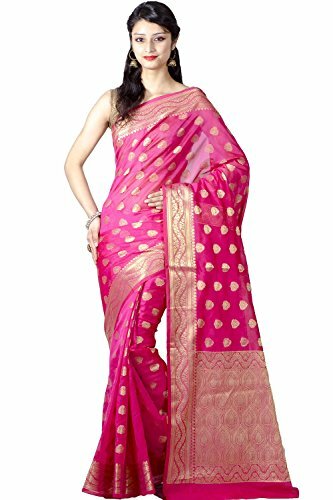 The beautiful Chandrakala cotton silk brocade saree with rich zari butis all-over the body and meene-daar border and pallu.The color offers a rich festive appeal.Total length of the saree is 6.2 metres including the Running Blousepiece of 80 cm which is attached at one end of the Saree. Looking for more Bridal Sarees similar ideas? Try to explore these searches: Make American Quilt, Video Motherboard Repair, and 18' Led Lamp. Look at latest related video about Bridal Sarees. Shopwizion.com is the smartest way for online shopping: compare prices of leading online shops for best deals around the web. 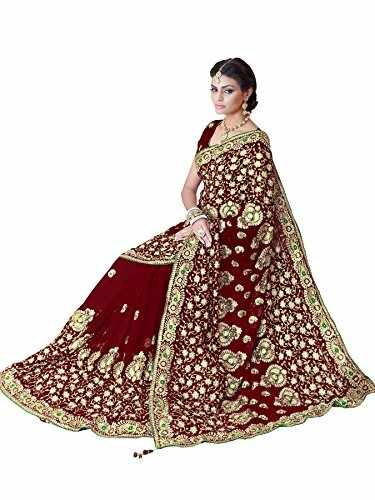 Don't miss TOP Bridal Sarees deals, updated daily.